PHNOM PENH — Japan is moving to bolster its footprint in the Mekong subregion by linking the Southeast Asian mainland into a broader Indo-Pacific Strategy allied with India, the United States and Australia. In what observers say is a move to counter China’s growing regional influence, Japanese Prime Minister Shinzo Abe’s national security advisor Kentaro Sonoura said ASEAN would be central to the Indo-Pacific Strategy at a conference on the Mekong subregion in Phnom Penh on Friday. “It is to realize quality growth of the region to promote the development of the Mekong region as well as ASEAN, and thereby assist the whole of Asia, including Japan, to enjoy prosperity and stability together,” Mr. Sonoura said. However the Indo-Pacific strategy – first announced by President Donald Trump during his visit to Vietnam in November – came on the heels of China’s Belt and Road Initiative and bears considerable resemblances to Beijing’s blueprint for regional expansion. Like the Belt and Road Initiative, it is primarily focused on infrastructure financing. Jane Bocklage, chargé d’affaires of the U.S. Mission to ASEAN, told VOA Khmer earlier this month that Indo-Pacific strategy was simply about recognising the importance of Asia’s growing need for infrastructure. “There is sufficient work to do on infrastructure, and connectivity, in Southeast Asia that we don’t have to be an alternative to China,” Bocklage said. Japan began expanding its engagement in the subregion in 2007 when it launched the Japan-Mekong Region Partnership with the five ASEAN riparian countries of the more than 4,000 kilometre river. In 2015 Japan renewed a pact to expand industrial and human resource capacity in the Mekong region called The New Tokyo Strategy, which was rolled at roughly the same time China establish the Lancang-Mekong Cooperation. 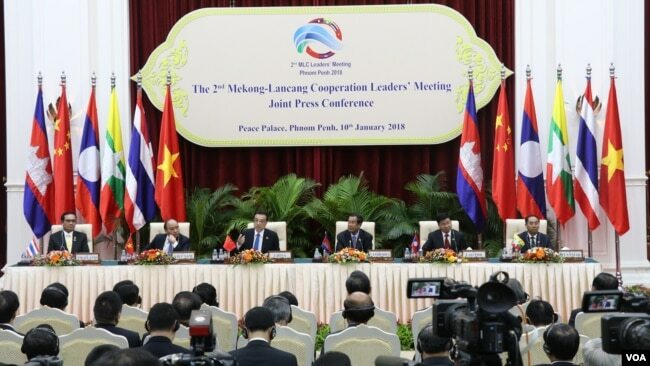 Cambodia has proved a reliably pliant regional ally for China, toeing its line at ASEAN on the issue of the South China Sea while enthusiastically supporting Beijing’s programs such as the Lancang-Mekong Cooperation and the Belt and Road initiative. However it remains a member of the Mekong River Commission – the creation of which was heavily influenced by the United States and a body to which China is only a dialogue partner, not a member. Cambodian government advisor Sok Siphana urged China and Japan to find common ground in developing regional programs that benefited countries such as Cambodia. 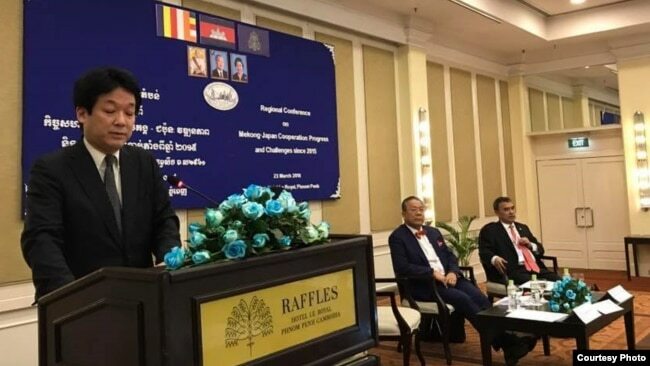 “Synergies between Japan, Mekong countries and other sub-regional arrangements, like the Greater Mekong Subregion (GMS), the Mekong-Lancang Cooperation and the Mekong River Commission (MRC), should be encouraged for further enhancement of regional connectivity,” Siphana said. Thitinan Pongsudhirak, a political scientist at Thailand’s Chulalongkorn University, said Japan’s attempts to expand it engagement in Mainland Southeast Asia could be challenged by a trend of growing authoritarianism in the region. “Governments and regimes in the Mekong mainland are becoming more authoritarian that tends to get along better with China and China tends to embrace authoritarian governments,” Pongsudhirak told the conference.